Truth be known, asking me for advice on thru-hiking the Appalachian Trail is about like asking the captain of the Titanic for advice on navigation. I struggled every step of the way in my 2005 thru-hike of this great national scenic trail. Of the people who made it all the way, I was one of the worst. In fact, there were many hikers who were much better and stronger than me who did not complete the hike. So while I am much more fluent in the subject of what NOT to do, I do have a couple useful pointers. First, except for an exceptionally strong or prepared hiker, I would advise thru-hikers (northbound) to not begin their hikes before the 1st of April. Yes, you will get plenty of bad weather after that. However, the extent of wet, cold weather that a hiker can face in the north Georgia mountains and Smokies at that time of the year can be flat out dangerous. You will expend great energy in dealing with it, and many become so discouraged they are prone to drop out. My second piece of advice has to do with conditioning. Yes, the most difficult two states on the AT are the last two, New Hampshire and Maine. It is correctly pointed out that any thru-hiker arrives there will have their ‘trail legs’ and be ready for the steeper grades and more jagged terrain. However, the next most difficult two are the first two, Georgia and North Carolina. Almost half of the potential thru-hikers drop out in these first two states. Just in the first 76 miles in Georgia, a hiker faces the likes of Blood Mountain, Tray Mountain, and several other peaks that hardly allow three straight flat steps the entire state. My point is that a thru-hiker needs to have his or her game face on early and be in at least pretty good physical condition to avoid early retirement from the trail. And the rewards are so great (the ethereal majesties of New Hampshire and Maine) up the way, you want to give yourself the best chance to complete this great journey. 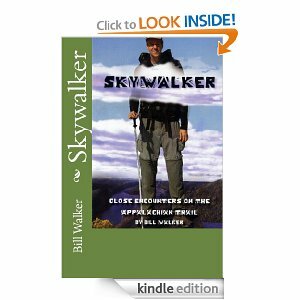 Bill Walker is the author Skywalker–Close Encounters on the Appalachian Trail. He is also the author of Skywalker–Highs and Lows on the Pacific Crest Trail, as well as ‘The Best Way–El Camino de Santiago’ (2013). Walker, who is just shy of 7-feet tall, is currently working on a whimsical book on the subject of height.